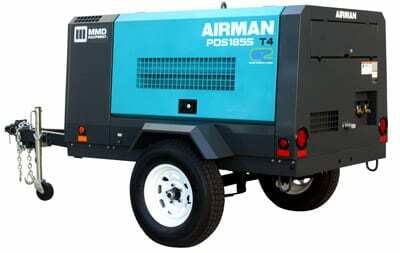 AIRMAN Air Compressors are the most reliable & durable air compressors in the industry! MMD Equipment has been the source of AIRMAN Air Compressors since they were introduced into the U.S. market 30 years ago – no other compressor compares. These air compressors are ultra-quiet air designed for today’s demands. They’re extremely reliable — which helps reduce downtime and maintenance as well as increasing yourprofitability. Our superior designs are fuel-efficient, light and well-balanced. 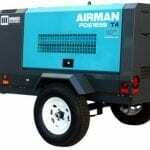 We offer the best fuel economy for any air compressor in its class. Our machine sound levels are as low as 62 dBA – substantially lower noise levels than competitors. Powder-coated finish, stainless steel hardware, and air pressure regulator with O-rings.